Playing outside linebacker for the Nebraska Cornhuskers during the late 80’s, Broderick Thomas garnered the nickname of “The Sandman” for his lights out sacking ability and received 2 time All America Honors. 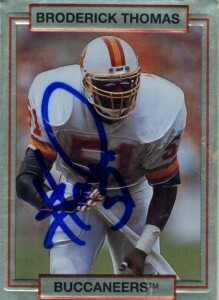 The Buccaneers took a shot at him, drafting him #5 in the monster 1989 draft. Based on his ability, statistics and attitude, this to me I thought was a sure fire pick, and the team quickly branded him as the ‘future’ in the NFL at linebacker. The bar was set up incredibly high and Broderick would have a hard time living up to those expectations starting no games his rookie season. He’d see continued improvement, with 7.5 sacks at LOLB in 1990 and a career high 11 sacks in 1991 at ROLB where he also contributed 174 tackles that season. 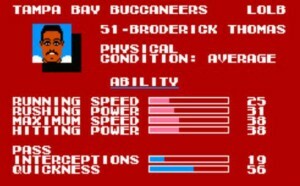 (Playing in Tampa however he’d not see the ProBowl.) Thomas would also pull down 2 picks and a touchdown and 3 fumbles in 1992, but with his sack numbers on the downward slide, he’d see free agency after 1993 where he only started 8 games. In 5 years with the Buccaneers, Thomas would finish with 26.5 sacks- which is probably about half of what was expected of him by the franchise. He’d continue the NFC Central tour, playing for both the Lions and Vikings respectively a season a piece and finish his career playing for the Dallas Cowboys in 1996 and 1997. I’d get his autograph while he was with the Cowboys at training camp in 1996 where he alternated at linebacker and defensive end. In fairness to Thomas, his statistics while not amazing, were respectable enough to allow him to become a respectable linebacker. He’d retire in 1998, due to a freak injury when he ripped his ACL during training camp. Tragically sacrificing himself for the sport, Thomas has suffered from a variety of arthritic related conditions, panic attacks, and depression- all from football- but has somehow managed to continue on. Nowadays, Broderick runs Broderick Sports Entertainment, fundraises for childhood diabetes and passionately follows everything Cornhusker related as an active alumni. Thomas is a prime example of why we must not forget our former gladiators and that life after football is not just a send off to retirement and riches without worry or pain.